The first Tigers were issued with Pz.3 turret bins, apparently attached at the factory. 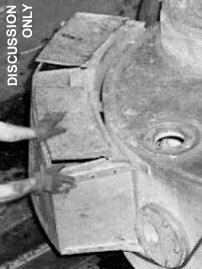 This bin was shaped especially to fit the small Pz.3 turret. A bin custom-designed for the Tiger was soon created. It was issued to s.Pz.Abt.501 while they were still training in Germany, and they removed the Pz.3 bins from the Tigers that they already had, replacing them with the new Tiger bins. 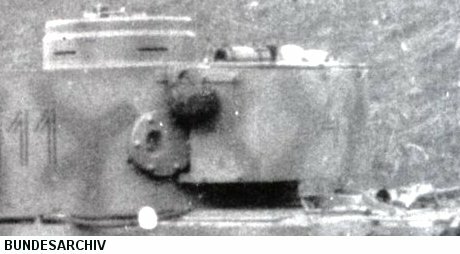 The bin was curved to fit the Tiger's cylindrical turret. It had parallel sides and was 1.4 meters wide. There were two lids, each with a single latch. The bin was attached to the turret by support beams on both its sides and underside. This 1.4 meter bin was apparently supposed to fit precisely to the rear of the Tiger's turret. But, in what was surely a designer's mistake, it collided with the two pistol ports. 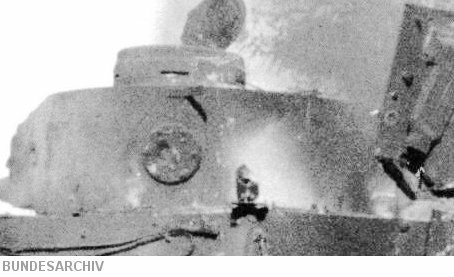 This photograph of Tiger 112 in Tunisia shows the problem. The solution, for most units who used this bin, was to mount it a few centimeters clear of the turret walls. This is Tiger 712 on arrival in the USA after its capture; the gap between the bin and the turret is visible. The latches on this bin were different to those used later on the "standard" turret bin. 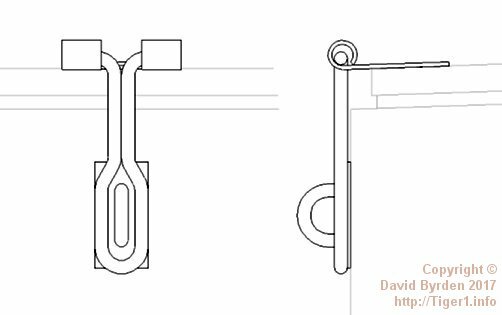 There are no known examples or German diagrams; this drawing is based on photographs. The bin's design was altered after about 20 units had been made. The new version had 4 latches. It was distributed with new Tigers around December 1942, going mostly to SS units but also to s.Pz.Abt.502 at Leningrad. By now, the Tiger's design had been altered, with a hatch on the right-hand turret side. This made the bin an even worse fit than before. We must assume that the bins were sent separate from the Tigers, not attached at the factory, because photos show that each unit developed its own style of attaching the bin and dealing with its poor fit. Every Tiger unit mounted the bin off-center. In most units it was allowed to overlap the left-hand pistol port. But there were variations in the number of supports, in setting the bin level with the turret roof or below it, and putting it off-center by different amounts. 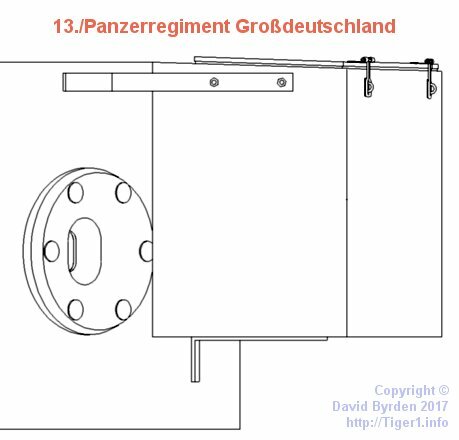 This diagram shows how the bin was typically placed on the Tigers of Panzer-Grenadier-Division Großdeutschland. There was one supporting bar bolted to each side, plus two supports underneath. The bin overlapped the pistol port only a little. A plan view makes it obvious that the Großdeutschland bins were off-center; note also the large gap between the bin and the turret. The turret side hatch only just cleared the bin when it was opened. 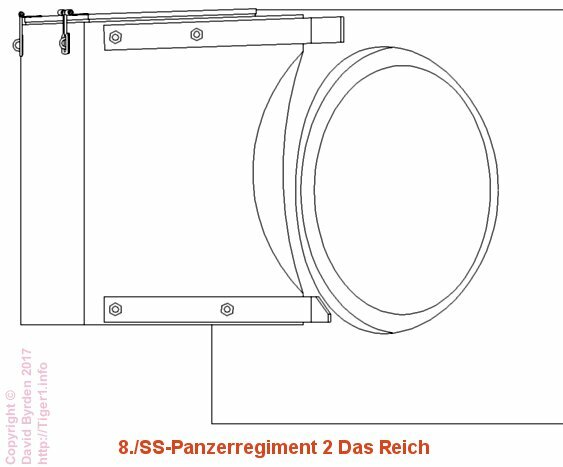 Photographic coverage of 4./SS-Panzerregiment 3 Totenkopf is poor, but they seem to have attached these bins in a similar way to Großdeutschland; i.e. using one support beam on each side. This burnt-out tank of Totenkopf has its bin removed, leaving the welded supports in place. There appear to be no bottom supports for this Tiger's bin. Only three Tigers of s.Pz.Abt. 502 had these wide turret bins. They were placed lower than those of Großdeutschland and they had two support beams per side. 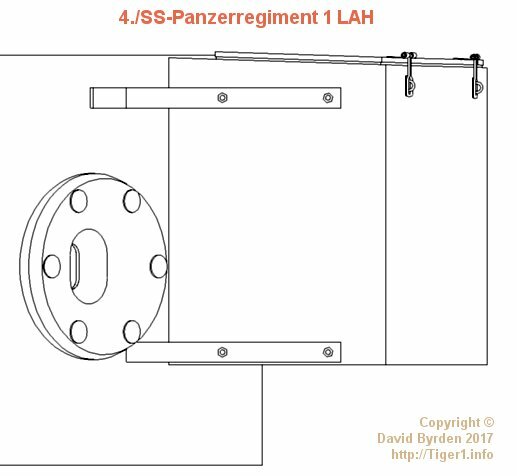 The 4./SS-Panzerregiment 1 "LAH" also used two supports on each side of the bin. Apparently they folded the lower support inwards instead of outwards. They don't seem to have put any supports on the underside of their bins. 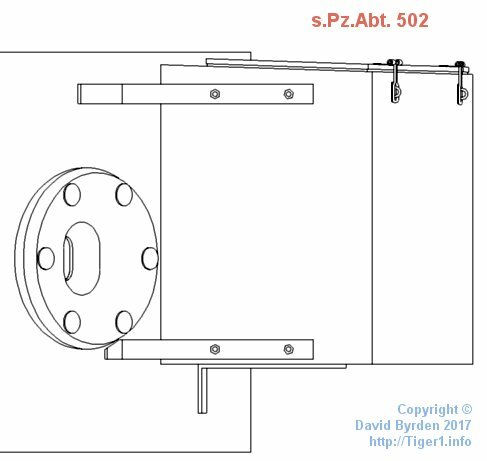 The spacing between the bolts varied widely from tank to tank in this unit; this diagram is based on their Tiger "405". 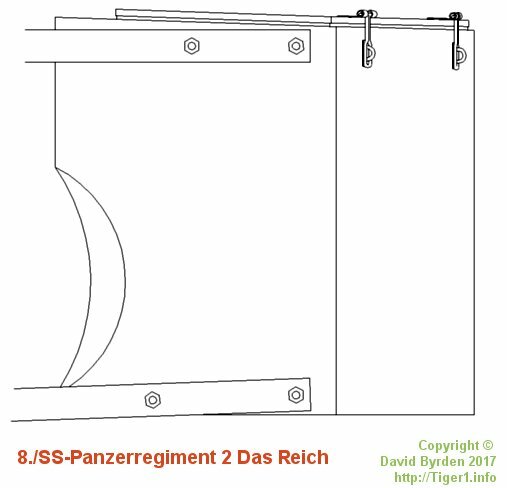 The "Das Reich" tank company had the most creative solution; they made cutouts on both sides of their bins to clear the pistol port and the hatch. This is the left side of a DR turret bin. The cutout was sealed up with welded sheet metal. On the other side there was a larger cutout, to clear the troublesome escape hatch. This diagram shows the bin fitted to the turret; the hatch is not drawn but the hole in the armour is. It's not clear whether this unit used supports underneath their bins also. 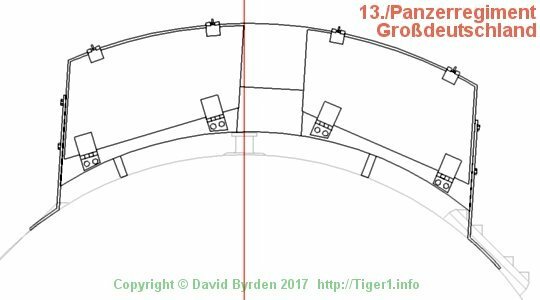 Thanks to these cutouts the bins of DR Tigers could almost touch the turret wall, as this plan view shows. But they were still mounted off-center; compare the bin to the center line of the turret, which is marked by a red line. 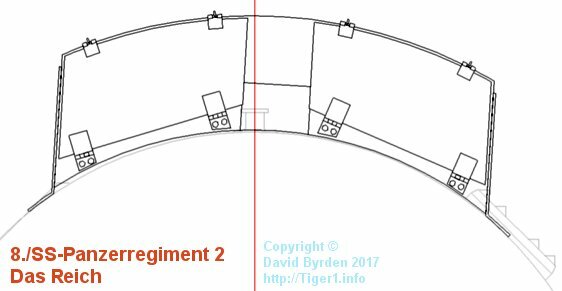 These three diagrams are all based on Tiger "812" whose bin was almost level with the top of the turret; some Tigers in this same unit had their bins a few centimeters lower. The size of the cutouts also varied from tank to tank. 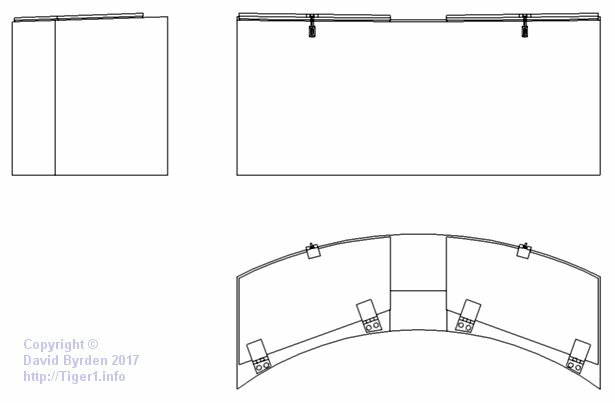 This drawing shows typical variations in the position of the bin and its supports.